In parts 1 and 2 I covered the more extravagant ways to store your video games, but I missed one giant way that seems to be quite popular, and that would be bookshelves. I personally don’t have room for a large set of wooden shelves, so I use the means which I covered in parts 1 and 2. 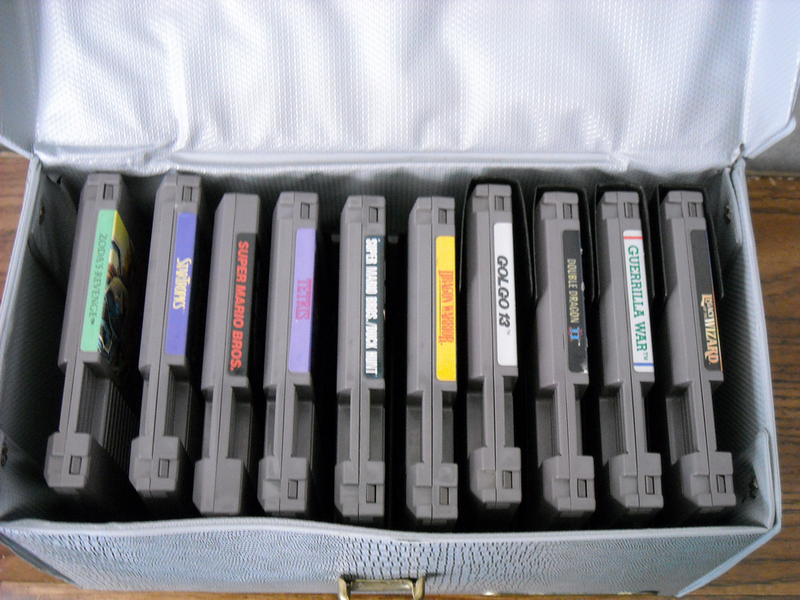 I also feel as though I may have been a little too focused on storing video games themselves, when in reality that is only the way I store them. The truth is the tall plastic drawers are a great way to store your consoles, AV/RF adapters, power supplies, controllers and almost anything else. 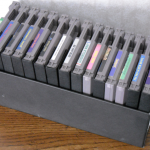 Now we have reached part 3, the in a pinch or not so glamorous ways to store and display your video games. 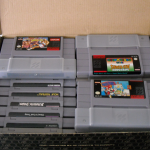 The only things I personally care about, when it comes to video game storage, is organization, safety, and how much I can pack into a concentrated space to make room for even more! 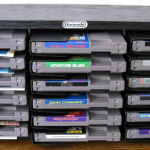 Not all of today’s storage solutions are quick fixes, but I do feel they fit in this article more so than they would have the previous two, but first lets start with a little tip I’ve worked out that has helped me store NES games. 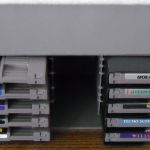 A few years ago, while moving video games around, I stacked some NES games on top of some Playstation cases. 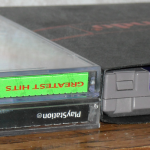 At first I didn’t really notice as I was focused in on getting everything organized, but it eventually struck me that a single NES cartridge is approximately the same size as 2 CD/Playstation cases. 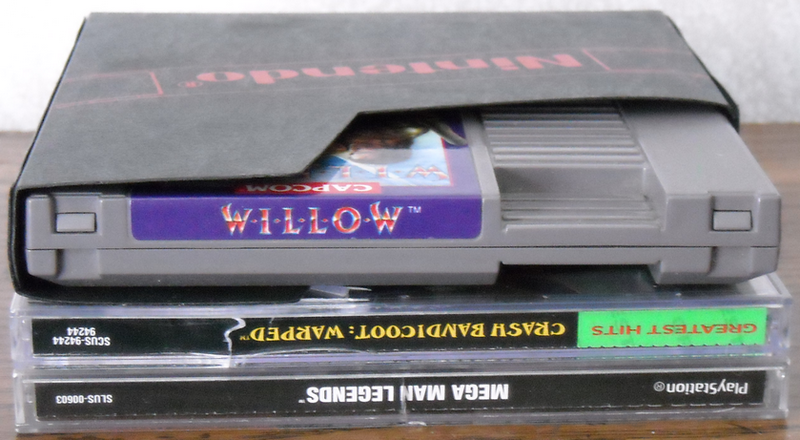 So when I’m out hunting I find a pair of CD cases and check if NES games will fit inside any given item I think would be good for storage, such as a cardboard postcard box. 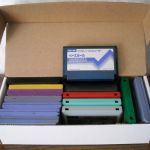 A solution I’ve found for storing loose SMS, Genesis and even Famicom carts are long, white cardboard hobby boxes. 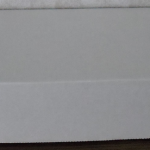 These boxes measure 11.5″ wide, 3″ tall and 4.25″ deep and are bigger than sports card boxes, so I have no clue what their original purpose is. 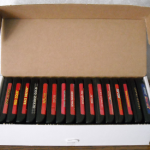 I’ve found a few of them along the way and they fit almost everything I want, although 32x and EA Genesis games take a little bit of organizational skills. 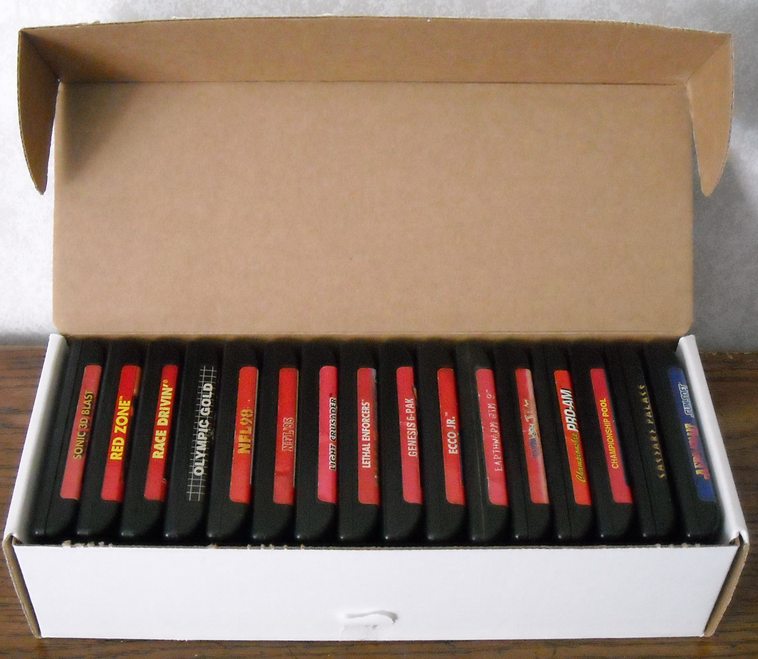 One of the most common ways to store your video games, at least the most common I’ve seen, are shoe boxes. 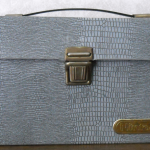 Almost everyone has an old shoebox laying around and if you don’t currently, you may soon in the future. 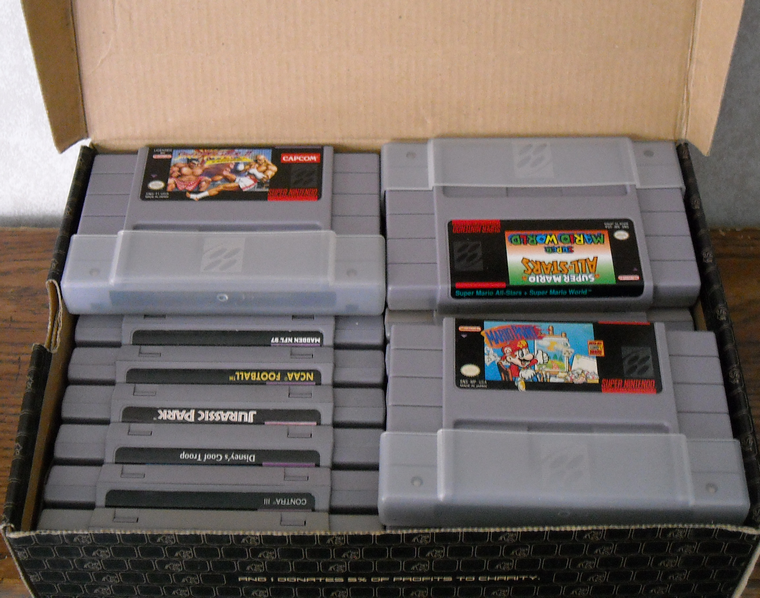 When I found my small SNES at a thrift store all the games came in a shoebox, and that is exactly where they have stayed. 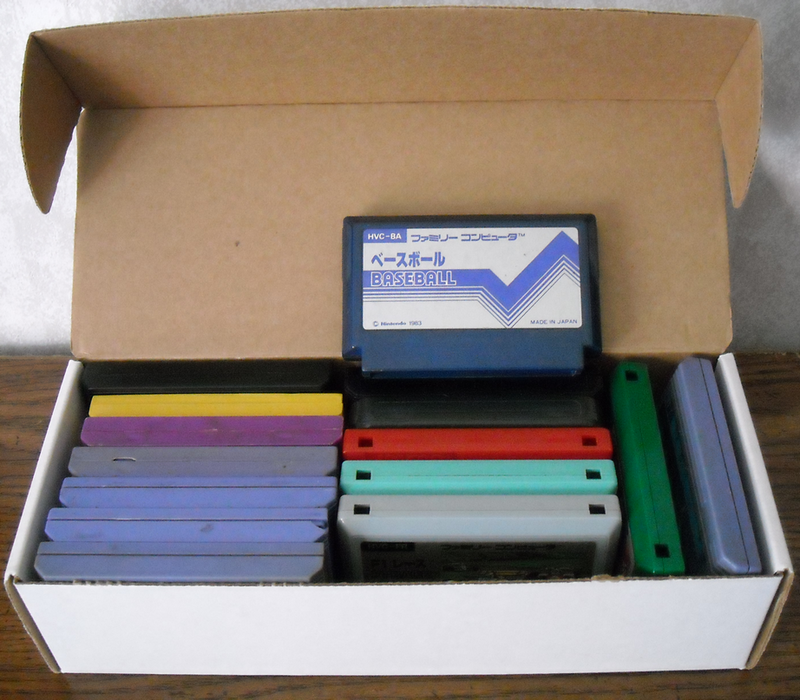 This box holds 20 games in order and an additional 4 games on the top, and it still closes properly. 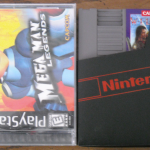 Now I arrive at the more niche items that were licensed by Nintendo, aren’t exactly something you’ll find every day, but are still only suited to do one thing and that is to store NES games. First up are two vintage units that I found at the outlet store, admittedly I thought the black one was home made, but some quick internet research proved me wrong. 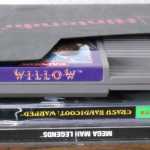 The gray plastic box holds 10 NES games (doesn’t hold them very well without sleeves) and has a place in the center for the manuals, although I prefer to keep game manuals in the sleeve with the cartridge. 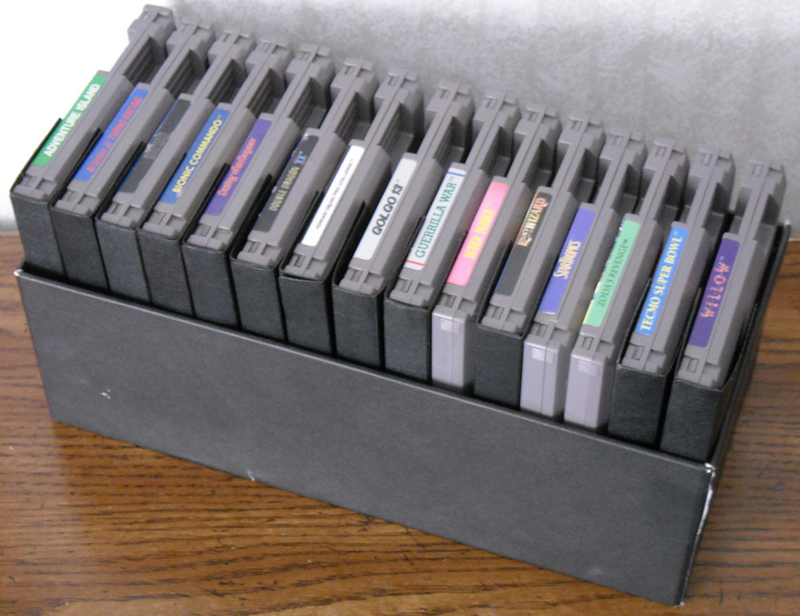 The black wooden box will hold 18 NES games (don’t even try without sleeves) but can also be mounted on a wall. 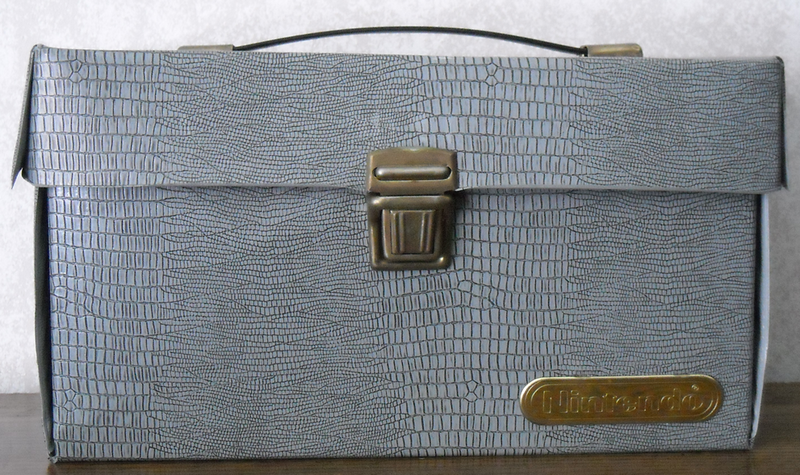 And finally is the only one I’ve managed to find, but Nintendo officially licensed these in a few variations, the faux leather/alligator NES game carrying case. These things are super cheaply made, so I’m assuming not many of them survived as they’re merely textures plastic covering a cardboard structure. 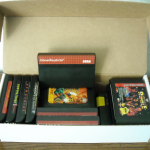 But unlike the previous 2 this one will hold up to 10 NES games with or without sleeves! 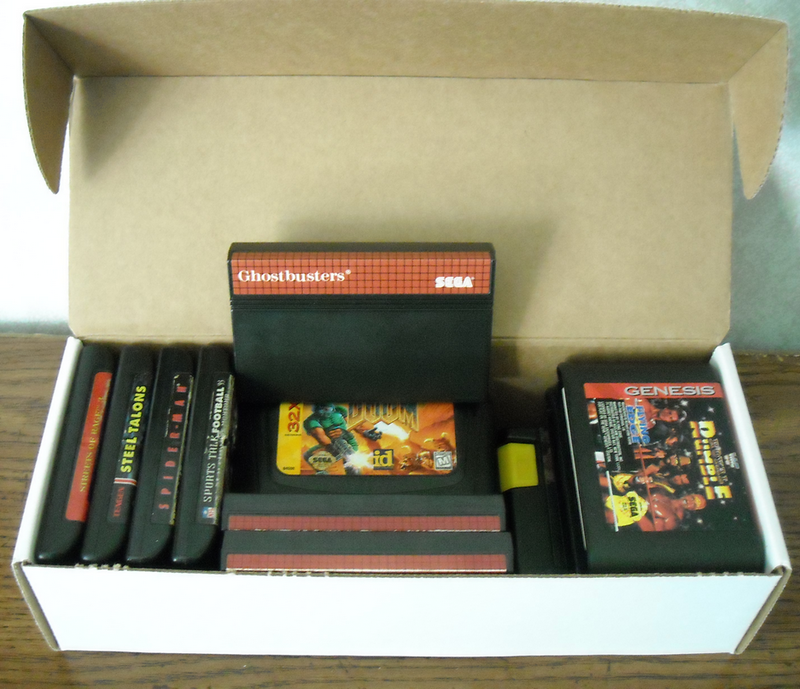 This also leaves a little wiggle room for manuals as well. 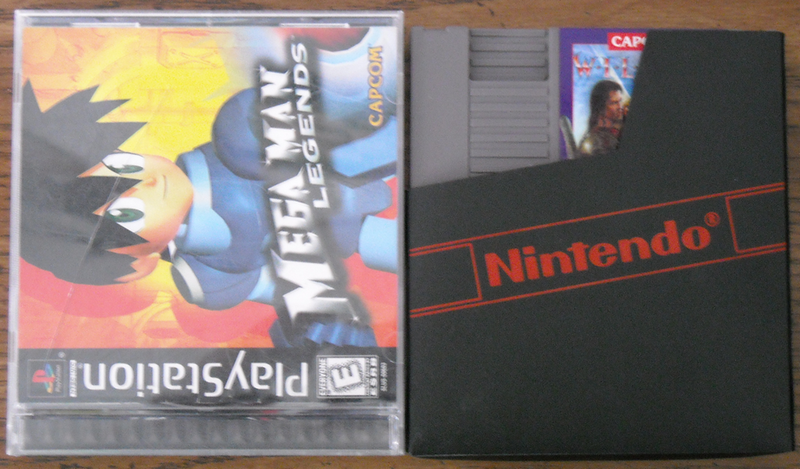 Well that wraps up part 3 of video game storage solutions, as well as all the ways I currently store my video games. Perhaps in the future I’ll find out more creative ways or more efficient ways and I’ll add a part 4. 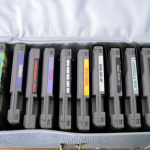 I hope this series has given some of you more ideas on how to store your video games, and don’t be afraid to comment below with your own video game storage solutions!